Until Tim Gresham takes some professional installation views of Wonder Room, I must content myself with my own snapshots, most of which were taken during the exhibition hang. They may not be up to Tim’s high standard, but they certainly bring back some great memories. Pictured top row left and right respectively: my Tall Tales vertical artist books, and a cabinet of tiny silhouette paintings. Centre insert: Wonder Room artist Paul Compton vigorously polishing the display case of the latter (thanks, Paul). Centre row, left to right: an installation view of Paul's superbly imagined and realised Cabinets of Wonder and a close-up of my favourite drawing in the series, The Dumb Waiter Cabinet, 2013. Other centre inserts: my Tall Poppies miniature painting and directly beneath it, a detail of Heather Shimmen's magical Wonder Broom (pictured just before it flew up to the ceiling of the gallery and refused to come down). Peeking out from under this is my Homo-insecta, a limited edition portfolio containing eight hand coloured linocuts of recently discovered insect women. On the bottom row left are a selection of Heather Shimmen's Celestials linocuts on felt and Rona Green's painting of plucky 'Bucky', 2013, photographed prior to their installation in Gallery 2. Bottom row right is another of my favourite works in the show, Rona’s The Doctor I: Vortis, 2010, one of several reincarnations of the immortal Doctor that are displayed in Gallery 1. 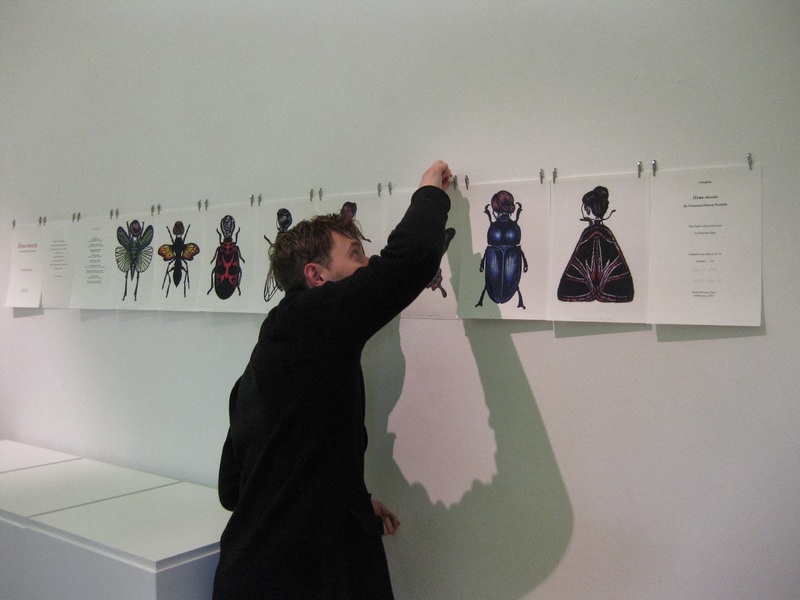 Paul Compton fine-tuning the display of the facsimile edition of my Homo-insecta porfolio. 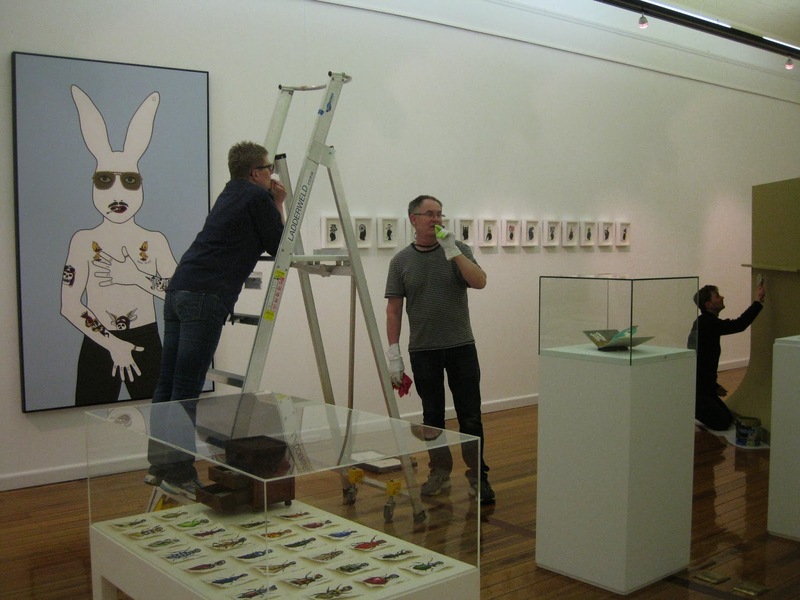 Left to right: Maroondah Art Gallery volunteer Jennifer, assistant curator Clinton Greenwood and Wonder Room artist Paul Compton hard at work on Day 3 of the installation. 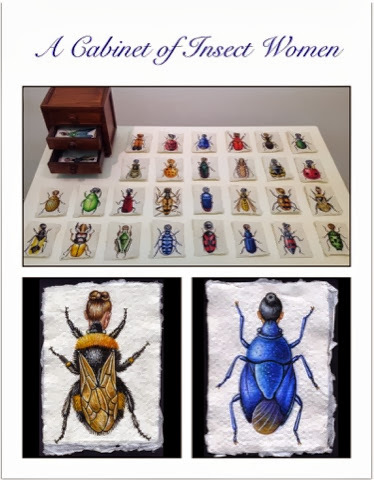 Artwork (clockwise): Rona Green’s painting Bogeyman, my miniature Shadow Women paintings, Paul Compton’s unique pop-up book Pickled and my Cabinet of Insect Women watercolours. Four happy artists: Heather Shimmen, Rona Green, Paul Compton and myself pictured during Day 1 of the installation of Wonder Room at Maroondah Art Gallery. Much credit for the exhibition's elegant design belongs to assistant curator Clinton Greenwood, who appears in both photographs at the top and, most notably, bottom left, in which the heroic hang of Rona Green's monumental painting Bogey Man has been captured for posterity. In the same shot, far left, is gallery volunteer Jennifer, who was also an essential part of Team Wonder Room. Also pictured are Clinton, Paul and Rona. To the right of this photo Heather Shimmen unveils her much anticipated Wonder Broom to the delight of Paul Compton. 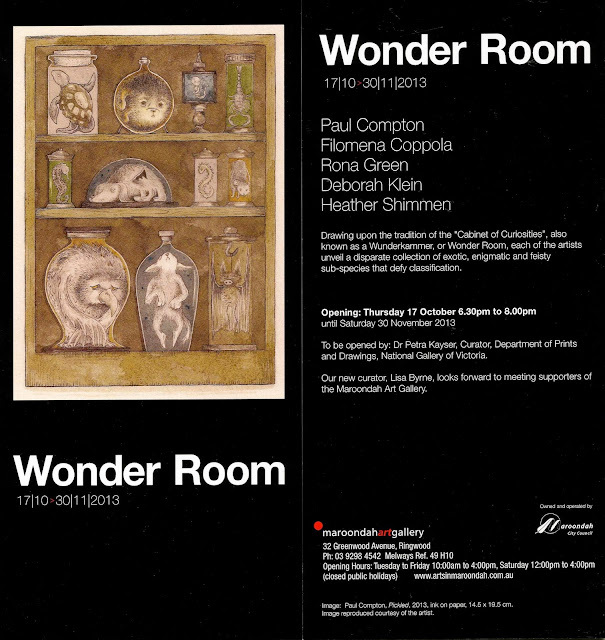 It now magically hovers over the other Wonder Room exhibits in Gallery 1. 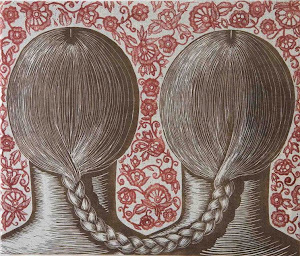 For those still contemplating a visit, the show runs until 30 November. As you enter, don't forget to look up. 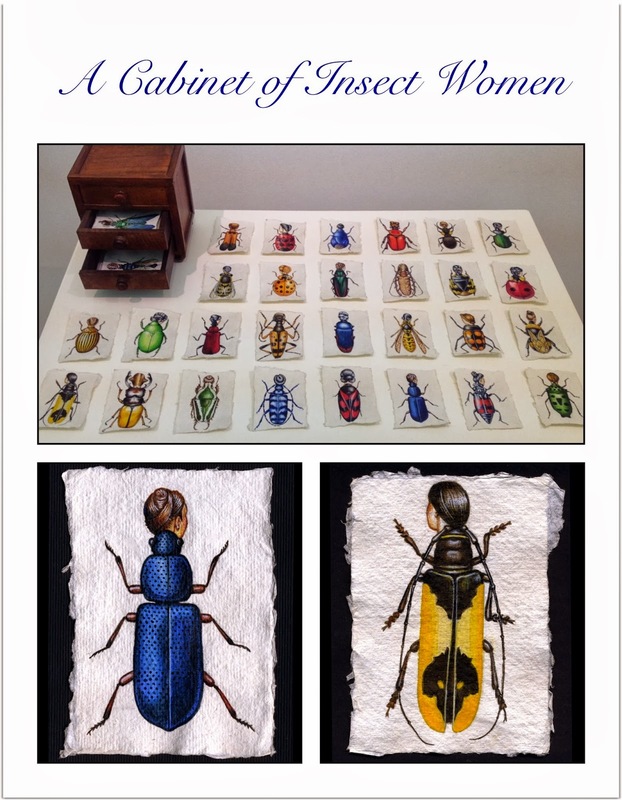 The result of countless field trips to a secret woodland location, this tiny plan cabinet houses watercolours of thirty newly unearthed sub-species, each one painted directly from life, to exact scale and in painstaking detail. The significance of this discovery is beyond measure. 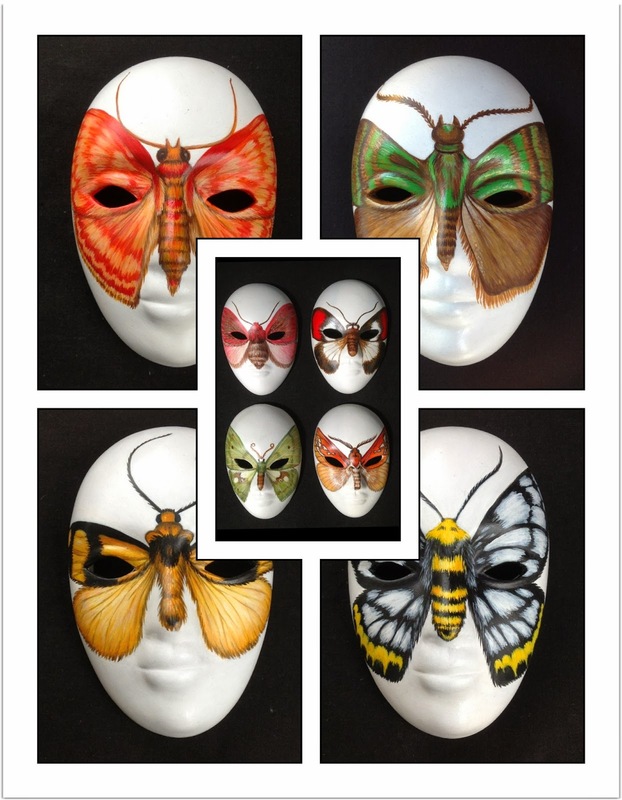 Until now, the elusive Insect Women were believed to be entirely mythological. The cabinet is currently on display in a room filled with equally extraordinary unnatural history specimens in the pop-up Wunderkammer Wonder Room at Maroondah Art Gallery, Ringwood, which runs until 30 November. Until then, pictured below is a preview of another of my Wonder Room exhibits. 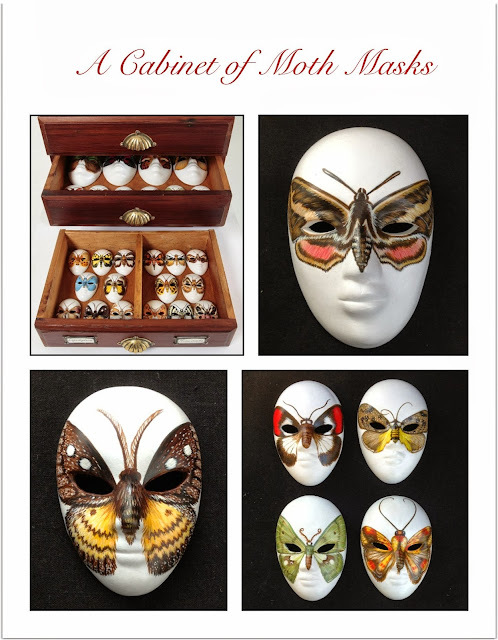 The majority of the work was made especially for the exhibition; however this Cabinet of Unnatural Curiosities is a continuation of a work that had its genesis in 2010. When the two artist books pictured on the left were photographed recently, their pairing was quite arbitrary. Coincidentally, however, they share a thematic link: both take well-known figures of speech as points of departure (one in the form of a pun). They tap into the nature of human aspirations, the first of which is - at best - impermanent, whilst the other, because it has no basis whatsoever in reality, is doomed to be forever unattainable. I’ve just finished re-reading Voltaire's timeless satiric masterpiece Candide, or Optimism (1759) and wonder if something of its sentiments (its highly ironic catchphrase is "all is for the best in this best of all possible worlds") were subconsciously absorbed into these two works - more particularly the latter. In Native American culture the attributes of the Bluebird are happiness, joy, and contentment. Similarly, the Oxford English Dictionary defines Bluebird as “happiness”. 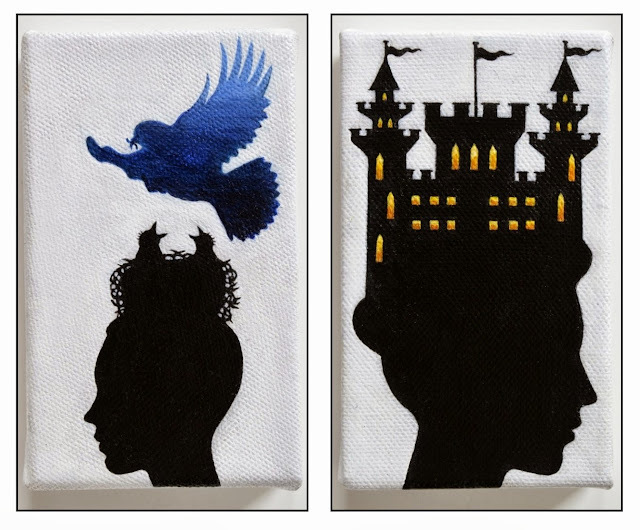 This symbology was the basis for the plot of l’Oiseau bleu, or The Bluebird, a 1909 play by Belgian playwright and poet Maurice Maeterlinck, which purportedly introduced the phrase "Bluebird of happiness". In this context the Bluebird has long been absorbed into popular music, which tends to stress its elusive nature, for example in the lyric Over the Rainbow: (1) "...Somewhere over the rainbow, Bluebirds fly/Birds fly over the rainbow/Why, oh why can't I?". Another song, also memorably performed by Judy Garland is I'm Always Chasing Rainbows: (2) "... I'm always chasing rainbows/ Waiting to find a little bluebird in vain". "In a word, whoever will consult common sense upon religious opinions, and will carry into the examination the attention given to objects of ordinary interest, will easily perceive that the opinions have no solid foundation; that all religion is but a castle in the air; that Theology is but ignorance of natural causes reduced to a system...."
"And that the Poet hath that Idea, is manifest, by delivering them foorth in such excellencie as he had imagined them: which delivering foorth, also is not wholly imaginative, as we are wont to say by them that build Castles in the aire..."
Pictured directly above are the miniature paintings that served as studies for the artist books. 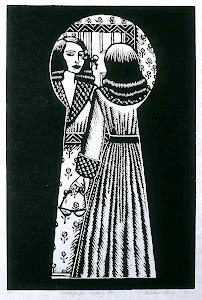 All the work featured in this post was made especially for the forthcoming exhibition Wonder Room. It will hang alongside works by fellow Wonder Room artists Rona Green, Paul Compton, Heather Shimmen and Filomena Coppola.